Confession time: I love pudding. Like, love it more than ice cream. Than cookies. Than two pound salads from Whole Paycheck. I love it more than shaved legs on clean sheets. Than running my fingers along wrought iron fences. Than blasting Kanye in my pint-sized powerhouse at 7AM (and I love that A LOT). Pudding is the perfect dessert. You can whip it up (well, this recipe at least) in less than ten minutes. And once it's chilled, you can spoon the creamy deliciousness straight to your face. Or you can load it with a bunch of toppings and then spoon it straight to your face. You can dip things in it (like graham crackers! ), use it to fill a pie, or freeze it to make double chocolate pudding pops (because it's almost summer and I've never met a person who doesn't like pudding pops) (HAVE YOU?). 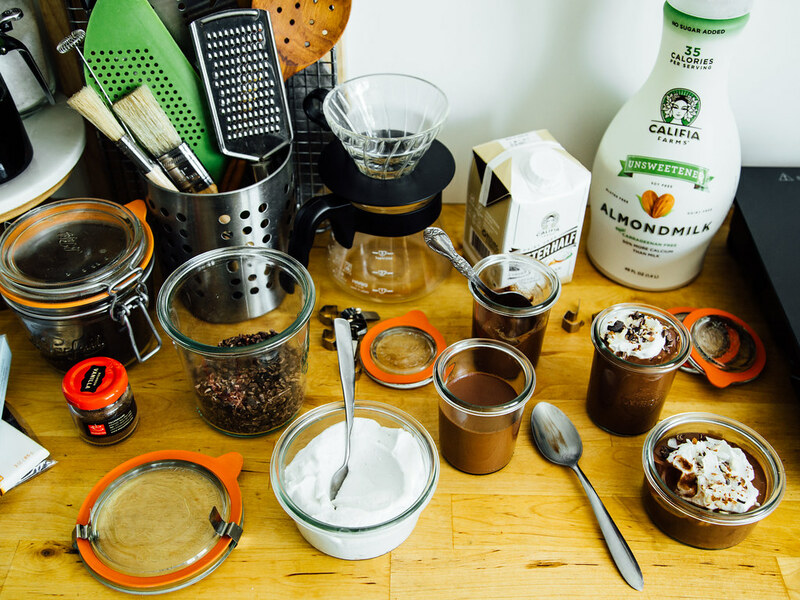 Pudding: it's easy, versatile, and delicious. And for those of you wondering why I would try to reinvent pudding without any of those things in the title, let me break it down for you. I had an accident with homemade, starch-thickened pudding a few years ago (and I still can't bring myself to make - or eat - the stuff). And I'm a firm believer that tofu and avocados don't belong in pudding (keep the black beans out of my brownies and applesauce out of my cookies, too, please). As for chia seeds, well, we all know that chia pudding isn't actually "pudding". So I set out on a mission to find a suitable thickener that would result in a pudding that's indistinguishable from its starch-thickened counterpart. And although the initial stages of the development process had me thinking coconut oil was going to do the trick, I wound up stumbling across something far more superior. So what was that superior something? PECTIN! It kind of blew my mind when I made the discovery because I was under the impression that pectin could only be used to thicken jams and jellies and fruit-based things of the like. But then I did some digging and learned that universal pectin relies on calcium for thickening (in a slightly acidic environment), which is much different than most varieties of pectin (which rely on large quantities of sugar). Armed with that knowledge, I connected the dots and came up with a testable hypothesis (I'm all about using the scientific method in the kitchen) (it makes me feel a little less terrible about the fact that I'm not using the degree I pay for each month), because if there's calcium in almondmilk and the combination of dark chocolate and cacao powder creates a slightly acidic environment.. universal pectin should be capable of thickening pudding. And I was right. So I've started testing my pectin-thickening hypothesis on other recipes (like homemade coconut yogurt and citrus curd) (and eventually - if I ever have a proper kitchen again - panna cotta and pots de créme), and hopefully I'll be able to share them with you sometime in the not so distant future. But in the meantime, you should try your hand at this pudding even if you're a lover of the stuff that's made with starch or tofu or avocados or chia seeds - because it's GOOD. 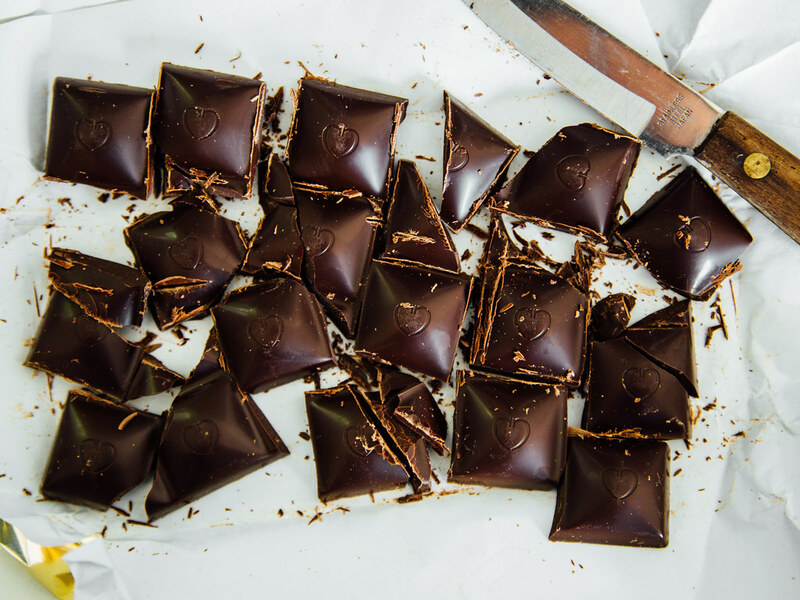 Like, eat-an-entire-jar-in-one-day good. PSST! I started a new page that will document recipe trials and notes along the way. It's mostly for me but, if you're even remotely interested in what recipe development looks like, it might be for you, too. Notes: The better half creamer is crucial, as it's one of the things that contributes to the weightiness of the pudding. 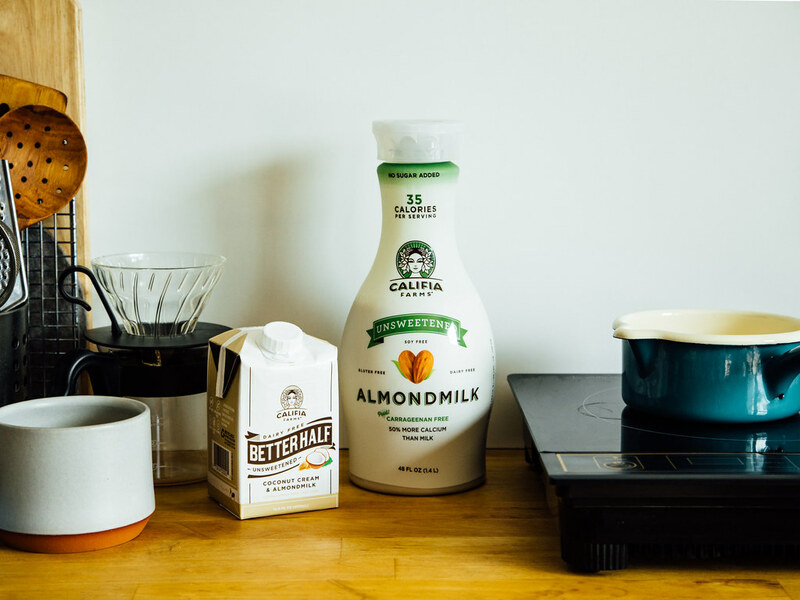 If you can't find better half (my preferred grocer just recently started carrying it), substitute unsweetened almondmilk creamer. And if you can't find that, full fat coconut milk should do the trick. For a kickass frozen treat (PUDDING POPS! ), use an additional cup of unsweetened almondmilk and the cream from the top of a can of chilled + full fat coconut milk, and pour the liquid into a popsicle mold. For super thick pudding (suitable to fill a pie), reduce the better half to 1/4 cup (55g). Add the better half, unsweetened almondmilk, and maple syrup to a small saucepan set over medium heat. 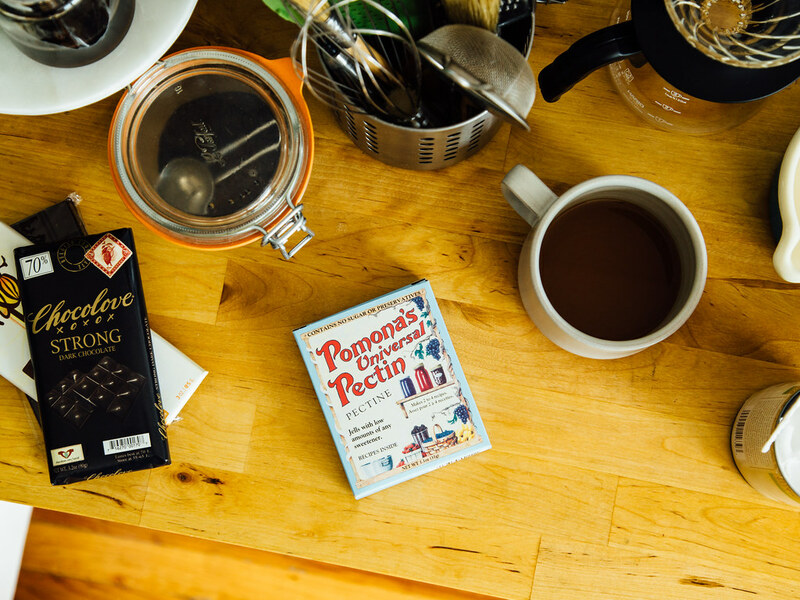 Bring to a light boil then slowly - while whisking - sift in the cacao powder and pectin then continue cooking for 2-3 minutes, just until the pectin has dissolved. Add the dark chocolate and whisk just until melted, then off heat, add the vanilla bean powder and salt, and give the pudding a good stir with a sturdy spatula (making sure to scrape the edges and bottom of the pan). 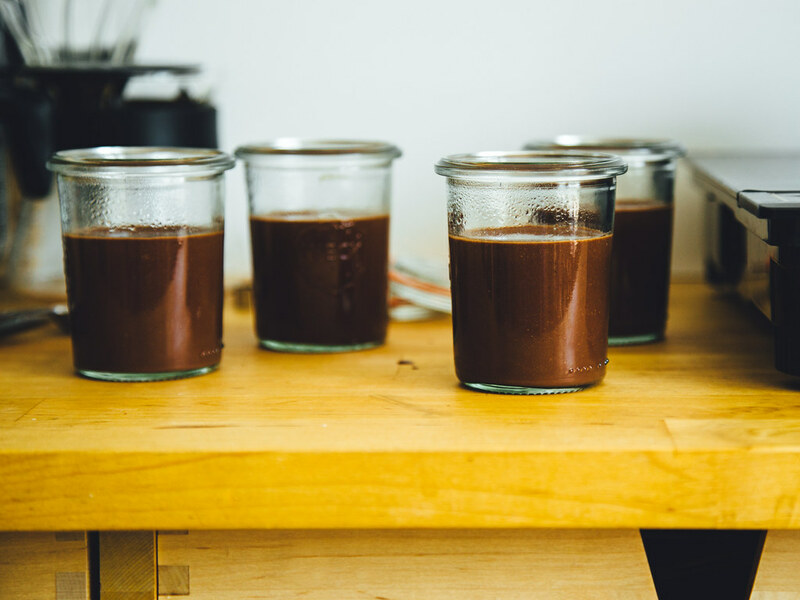 You can either pass the pudding through a sieve and into one large jar (my go-to method), or into four small jars. The former requires a stir with a whisk after chilling and before consuming, and the latter results in pudding that can be eaten straight from the jar. 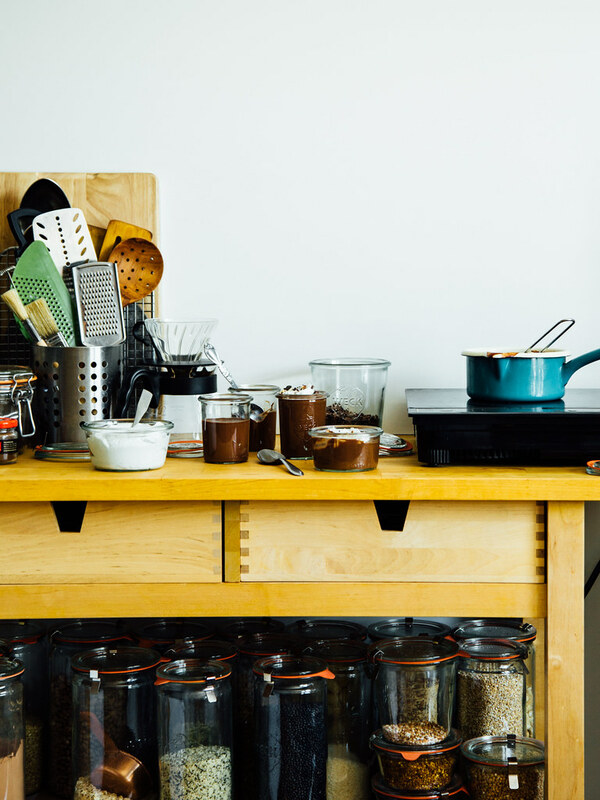 Whichever route you go, allow the pudding jar(s) to cool on the countertop for 30-45 minutes, then cover with a lid and transfer to the refrigerator to chill for at least eight hours. 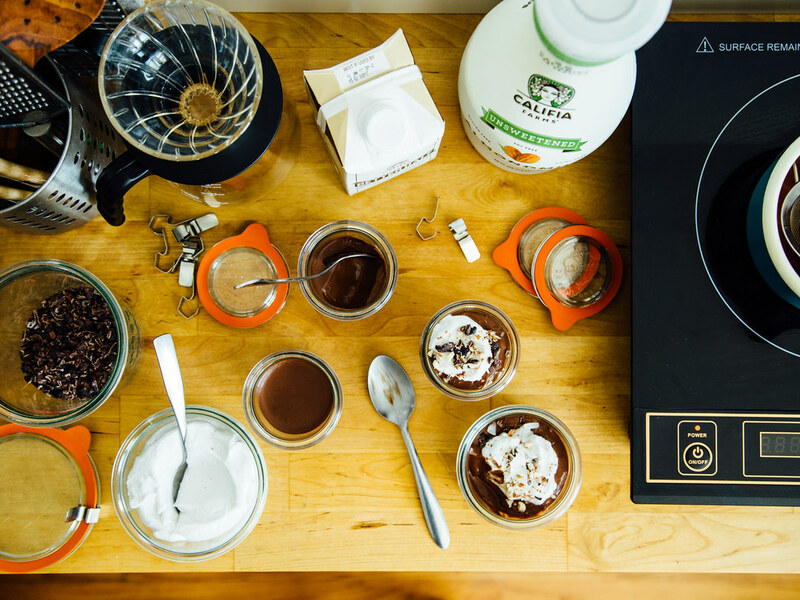 When you're ready to serve, top with coconut whipped cream and any of your favorite toppings. Pudding will keep, covered in the refrigerator, for up to three days. 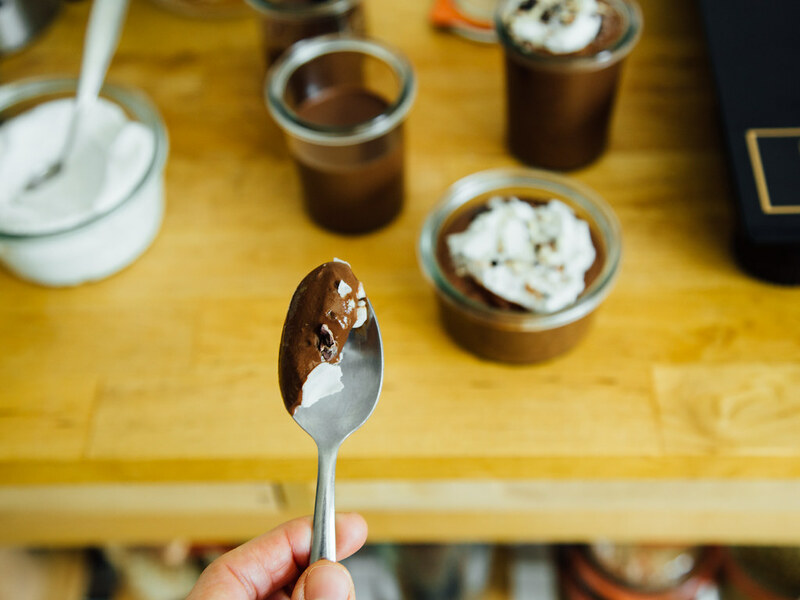 Refined sugar-free chocolate pudding - replace the dark chocolate with unsweetened chocolate and increase the maple syrup to 1/2 cup. Boil the liquid + pectin mixture for 1-2 minutes more. 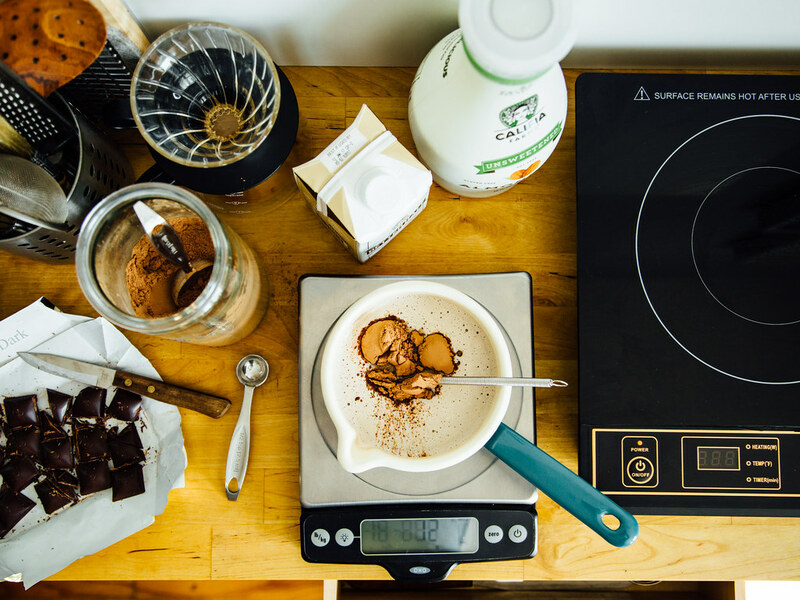 Double cacao pudding (also refined sugar-free) - replace the dark chocolate with two ounces of cacao butter and increase the cacao powder to 6 tablespoons and the maple syrup to 1/2 cup. Throw in a teaspoon of lucuma powder, if ya want. 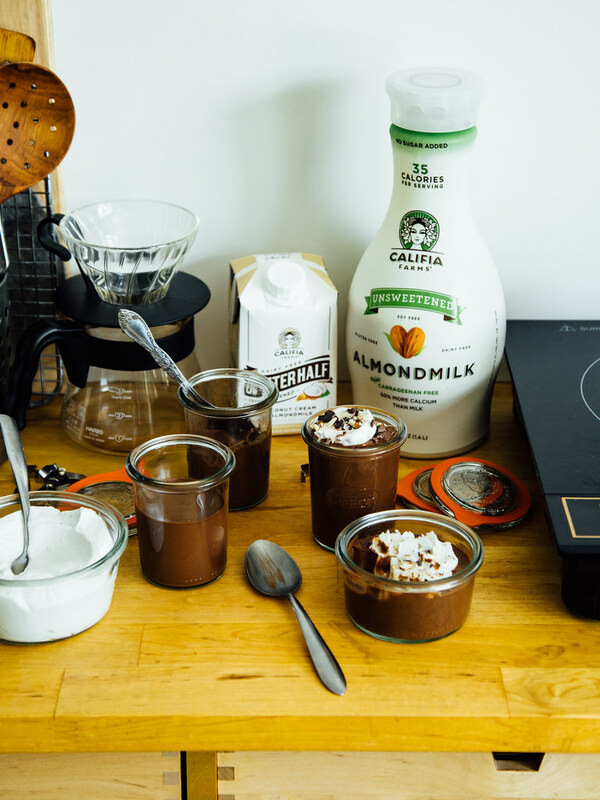 Mocha pudding - toss in 1/2 a teaspoon of your favorite instant espresso powder (do not use strong brewed coffee as the water content will alter the consistency) and use Califia's black & white in place of the unsweetened almondmilk. Mayan chocolate pudding - add 1/4 teaspoon of ground cinnamon and a pinch of cayenne pepper. 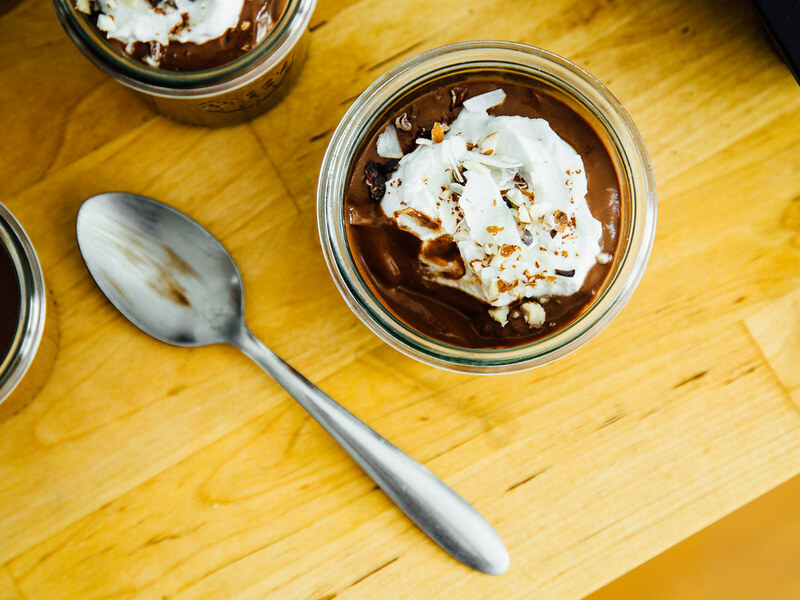 Peanut butter chocolate pudding - add an extra 1/4 cup of unsweetened almondmilk and stir in 1/4 cup (64g) of creamy natural peanut butter when adding the dark chocolate.